Authors: Joshua S. Bloom et al. We’ve devoted a lot of posts to the topic of active galactic nuclei (AGN) — but what about the inactive galactic nuclei that make up the centers of the vast majority of galaxies? It turns out that these generally dormant massive black holes (MBHs) can do some pretty interesting things, too. The authors of this paper propose that a very recent observation by Swift, a satellite which is designed to search for gamma-ray bursts, provides an intriguing example of this. This observation is hot off the presses! The Swift satellite discovered Sw 1644+57, a high-energy transient, on March 28, 2011. 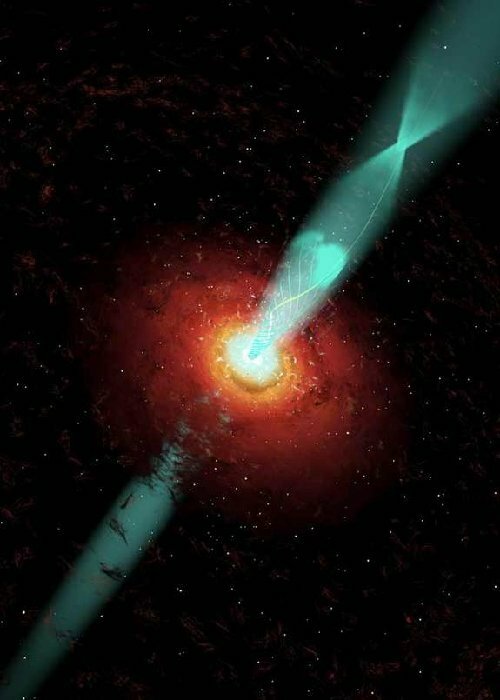 It was initially identified as a long-duration gamma-ray burst, until the longevity and flaring of the X-ray afterglow made it evident that this transient behaved unlike any GRB previously observed. A companion paper details the observation itself and how it differs from the GRB population observed by Swift. Inactive MBHs aren’t doomed to live a quiet life forever. If a passing star gets too close to the MBH and is torn apart by the gravitational forces (see Figure 1), it can accrete around the MBH and feed it. This causes a temporary period known as a tidal disruption flare (TDF), during which the MBH “turns on”, displaying activity which can include jetted relativistic outflow. Figure 2: Schematic representation of the geometry for Sw 1644+57. An analogy with blazars and AGN for more massive BHs is given. Fig 2 in the paper. 1) SW 1644+57 appears to be located in the center of the host galaxy, based on observations at X-ray, optical, infrared and radio wavelengths. 2) The associated radio source suggests an emission region no larger than 5 parsec, making possible extended emission sources unlikely. 3) The X-ray spectrum behaves similarly to those of blazars. 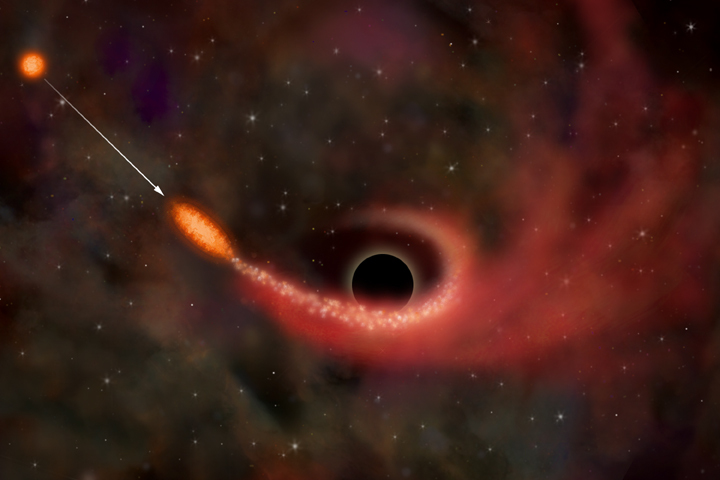 The authors calculate that if their accreting MBH hypothesis is correct, then the source would be a black hole that suddenly underwent a dramatic turn-on to very high accretion rates, launching an energetic, relativistic outflow in the process. The authors then go on to speculate about the observed spectrum, which is reminiscent of that of a blazar (see Figure 3). 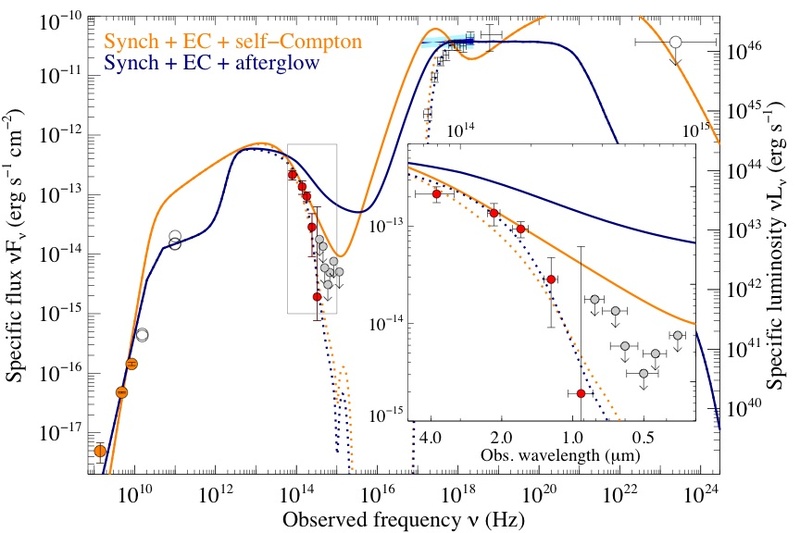 In blazars, the low-energy component (typically modeled as synchrotron radiation) and the high-energy component (typically modeled as Inverse Compton emission) are usually assumed to be directly related. For Sw 1644+57, the authors instead conclude that the spectrum is best explained if the two types of emission originated from different radii. The X-ray emission seems to have an internal origin, but the radio emission could instead result at larger radii from the interaction of the jet with the surrounding interstellar medium. The jet, as it has only just turned on, must burrow into the surrounding medium, forming a shock which could power the synchrotron radiation. This model provides specific predictions about how the radiation will fade over time in the radio and infrared, so observations over the coming year should determine whether or not the authors’ hypothesis is correct. Figure 3: Multiwavelength spectral energy distribution of Sw 1644+57, with model blazar spectra shown. Fig 1 in the paper. 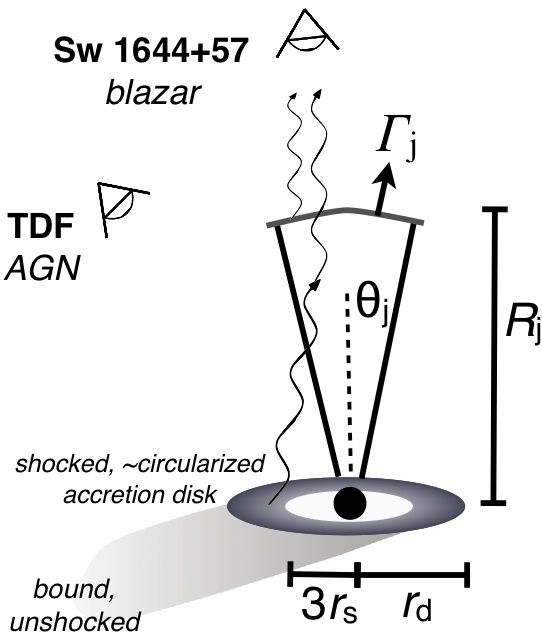 Finally, the authors address a longstanding debate about AGN jets by demonstrating that the magnetic field required to power the jet in Sw 1644+57 must be generated locally in the disk by instabilities or dynamo action, as opposed to being advected in with the flow. This debate has been unresolvable in normal AGN due to the different size scale. Magnetic field generation and transport, disk-jet interactions, and radiative mechanisms are just a few of the many aspects of black holes that are not yet well-understood. If the authors’ theory is correct, then there is a solid connection between TDFs and active galaxies. Events like Sw 1644+57 could therefore provide us an exciting new window through which we can learn about black holes.